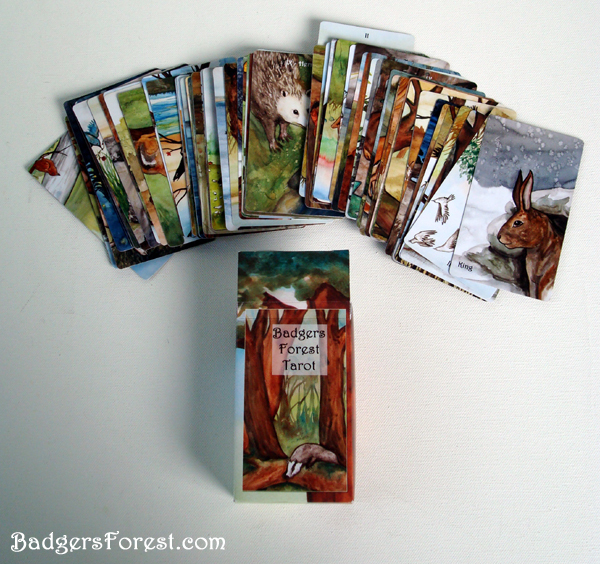 There’s a charming deck in the making called The Badger’s Forest Tarot by the lovely Nakisha VanDerhoeven, whom you may recognize as the creatrix of the wildly popular art decks The Rabbit Tarot, TaRat Tarot and The BlueDogRose Tarot decks. On KickStarter now, you can have the chance to not only support this deck but also receive some pretty awesome backer rewards as well! This deck is a labor of love that has taken over three years to create. There are 78 cards in this deck, each one created with my unique, original watercolor art. Though it’s based on traditional tarot meanings, the suits are wild animal based; the Badgers represent swords, Foxes represent cups, wild Rabbits represent wands, and Crows represent pentacles. The Major Arcana includes other wild animals; bears, deer, boars, goats, squirrels, raccoon’s and more, all set in a mystical woodland setting. This is my first full sized tarot deck , 2.5” x 5” with named and numbered cards and a reversible back. The finished deck will come with a color printed tuck box and basic sheet of card meanings. The images, which can be seen on her KickStarter page are absolutely charming and done with great attention to style and detail. I really hope that you will venture on over and check this deck out! I just love self published decks and this is one not to miss!